Before using the risk analysis approach to estimate the possible risks of blossom blight and latent infection for a specific orchard, the inoculum potential of the orchard should be determined. Since the main inoculum sources most likely come from the orchard locally, the estimation of inoculum potential in orchards could roughly represent the basic field inoculum situation. Randomly collect 200-300 flowers at the popcorn to full bloom stage. Soak each 100 flowers into 300 ml of 3% commercial bleach (about 10 ml bleach + 290 ml water) for 5 minutes. Wash these flowers with water 5 times each for 3 minutes.  Sterilize a plastic container (16 by 12 inch or larger) by washing it with bleach twice. Wet and place paper towels on the bottom of the container (2 layers). Place individual flowers on top of the wet paper towels and cover the container to keep high humidity. Incubate the containers at room temperature for 5-7 days. Count the flowers that show sporulation of Monilinia fructicola on the stems. 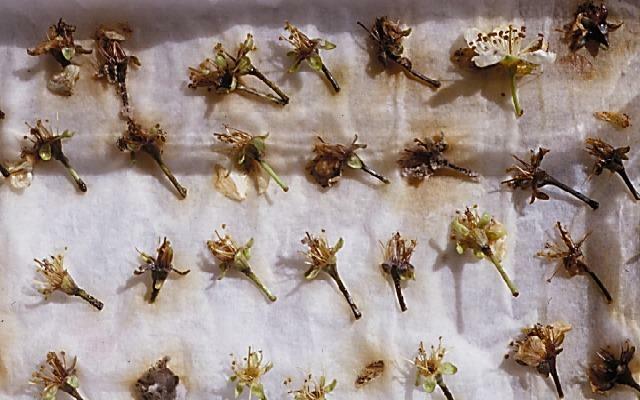 When the incidence of diseased flowers <= 1%, the orchard should be considered as having a low inoculum potential, otherwise, it should be considered as having a high inoculum potential. This picture shows an example of flower incubation to determine the incidence of infected blossoms. This picture can be used to identify the symptoms of blossom blight. 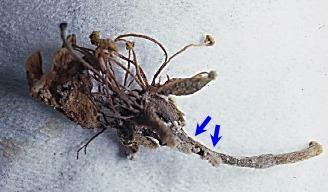 This infected flower shows sporulation (arrows indicate) on stem.